Rotherham-based Origin Broadband has raised over £2,200 in six months for their chosen charity, Ataxia UK. Hosting the sixth largest broadband network in the UK, the fast-growing provider has attracted significant investment, allowing Origin to move its head office from two sites in Doncaster to a single, larger base in Manvers. Ataxia UK is the leading national charity in the UK for people affected by any type of ataxia - an umbrella term for a group of neurological disorders that affect balance, coordination and speech. 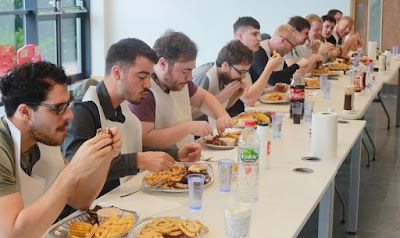 Since the beginning of April, colleagues have raised money by starting their own tuck shop, hosting bake sales and running other events such as a Man V Food challenge and sweepstakes for the World Cup and Grand National. Earlier in the year, everyone at Origin put their chosen charities to vote and Ataxia won their hearts. Helen Carling, head of marketing at Origin Broadband, has a daughter called Izzy who is 11 years old and suffers with Friedreich's Ataxia which is a genetic form of Ataxia. Origin's goal was to raise £1,200 to help fund a full-time junior researcher for a month, to help Izzy and other children who are living with this condition. Origin nearly doubled its target by raising over £2,200 for the cause. Steph Marley, communications manager at Ataxia UK said: "The £2,200 from our friends at Origin will not only allow us to fund a junior researcher for one month, getting us ever closer to finding a cure for ataxia, but will help run our helpline to help provide advice and information. We receive no government funding and our income mainly comes from people who donate and raise money, just like Origin have. We can't thank them enough for the time and energy they've given to raise money for Ataxia UK." Oliver Bryssau, CEO of Origin, added: "I want to thank everyone at Origin for their generosity and their time raising money for Ataxia UK. It's been amazing to work with such a great charity who have helped support us during our fundraising."